Nestled on an Eatonville side-street, just off the main thoroughfare of Washington Ave, sits a diminutive but charming icon of healthy living – the Mountain Community Co-op. 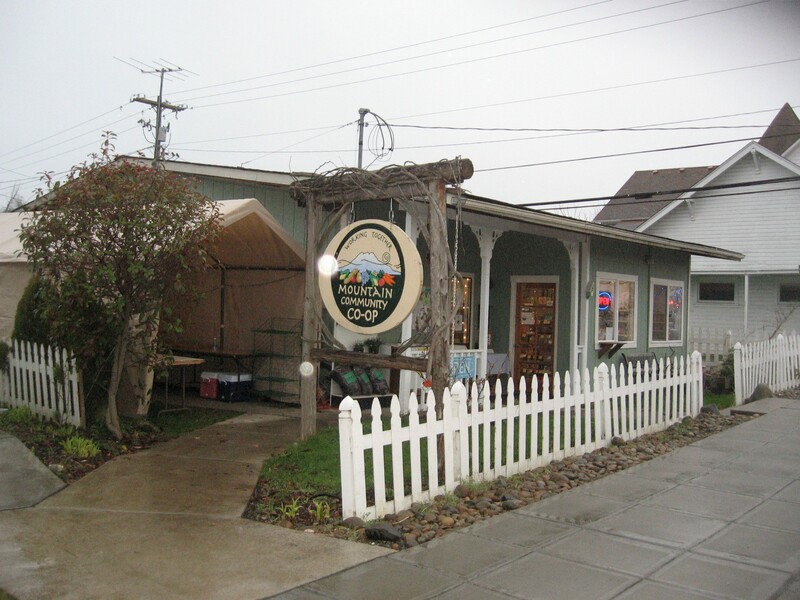 Established six years ago by Margaret Franich and a group of Eatonville friends hungry for healthy food, the co-op is open to the public and is operated by its 50 or so volunteers – all dedicated to providing natural and organic foods, and locally-made products, such as soaps, jewelry and knitted clothing. In terms of foodstuffs, the co-op has a wide variety of produce, meats and dairy products available. Local cattle ranchers, such as Billy Ottaviani, provide grass-fed beef, while certified raw milk comes from an organic dairy in Tenino. Fresh organic produce is available on a contract basis every-other Saturday, and unsold items can be purchased on the following Monday. Also, Margaret said that expanding the co-op’s ability to keep produce crisp and fresh throughout the week, such as with walk-in coolers and covered outdoor stands, is a major priority for the cooperative. The cooperative clearly sees that it needs to address its limited capacities, and that will take more than just money – or rather, it will take an expanded work force that can support an increase in sales that in turn will generate the monies needed. Coombs would also like to see the co-op open a second store in Graham. “We’re being accepted by the community here in Eatonville, and I’d like to see us expand that sense of community by bringing our services to Graham – that’s my mission,” Coombs said. This theme of community also runs deep in the historical arc of how the co-op came into being – and how it found a home in Eatonville. In her village, called “Mountain Village” by the residents, Margaret says she came to realize that the people there lived in a state of interdependence. 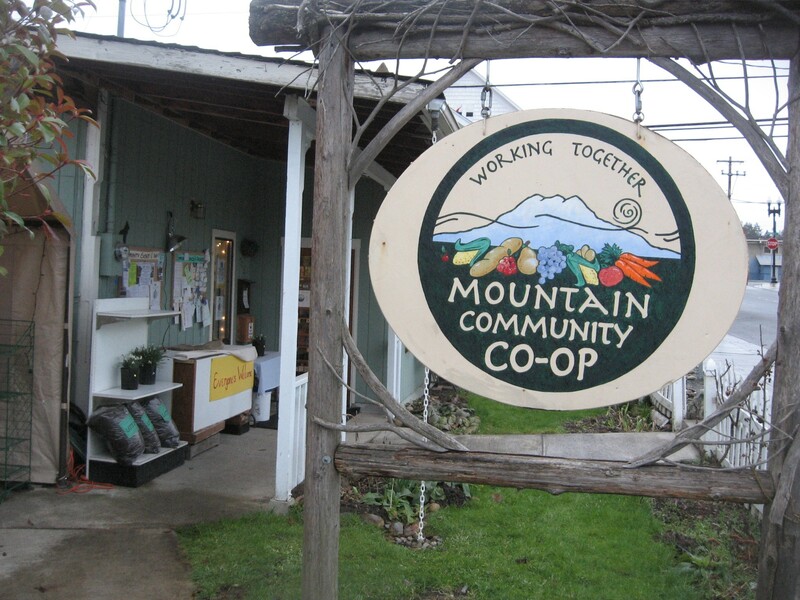 As seen on their store front sign, "Working Together" is the motto of the Mountain Community Co-op. Over time, Margaret says she formed an idea of how to bring the lessons she learned in Mountain Village to a village by the Mountain. It also took a guy named Tony to propose marriage and bring Margaret back to Eatonville after her Alaskan adventure. Nevertheless, Margaret’s vision calls for a large-scale complex of stores, craftspeople and community support services. In addition, Margaret found Eatonville an ideal place to plant her ideals. “Eatonville was a perfect place to build community,” she says. In Eatonville, Margaret found plenty of kindred spirits along with the bounty of the surrounding agricultural lands. She also sensed that Eatonville was ripe for a cultural change. “Eatonville was at-risk of being overwhelmed by outside sources, such as large, corporate stores,” Margaret said. She also knew that knew many people enjoyed the independent nature of Eatonville and would help to strengthen and expand it. Margaret has personal experiences with these types of communal cooking facilities. Margaret also sees the potential for the community complex to conduct job training, especially for those who have difficulties finding employment. 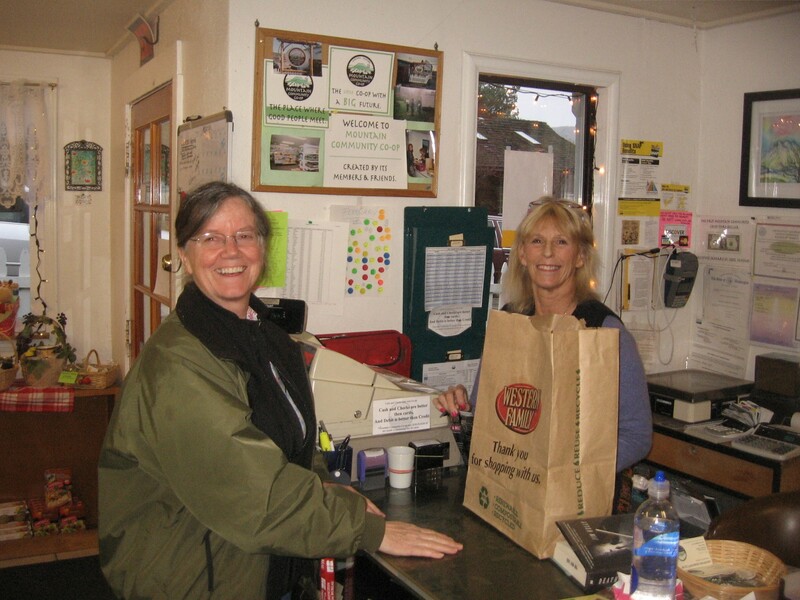 Some of these ideas of interdependence are already seeping into the current activities of the co-op, as the Truly Scrumptious Bakery in Eatonville, most commonly known by its former name – the Ohop Bakery – now partners with the cooperative to bake organic breads. “We take our organic flour and use the bakery’s kitchen to make some of our breads, which are then available on our “Produce Saturdays,” announced Margaret. Another part of Margaret’s grand vision is to have community gardens and education programs that raise awareness of healthy living. In addition, she would like to see every school have a large garden where the students would learn how to raise nutritious food, and then they would cook it in the school’s kitchen and directly reap the benefits of their labor. In addition, the co-op is sponsoring workshops a few times per month at the Eatonville Library on a variety of health issues, such as seed saving or the recent seminar on vitamin D.
The oft-discussed goal of having a farmer’s market in Eatonville is also on Margaret’s’ list. Margaret also stressed that farmers’ markets require a lot of infrastructure, such as protection from the elements, bathrooms, parking and eateries. She also indicated that the Eatonville Chamber of Commerce and the Town of Eatonville are at the forefront of establishing a farmer’s market this year or next. 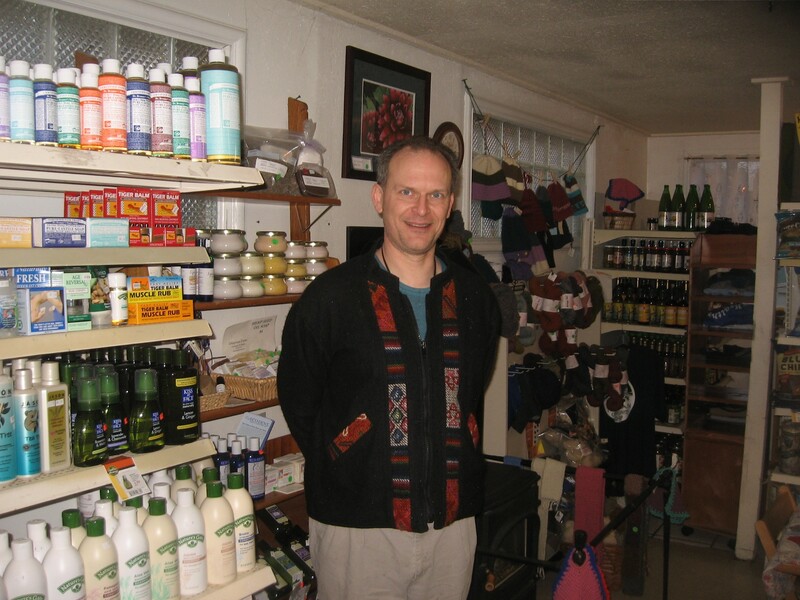 The labor of volunteers, such as Dave Kopec, pictured in front of a lotions and soap display, are vital to the co-op. 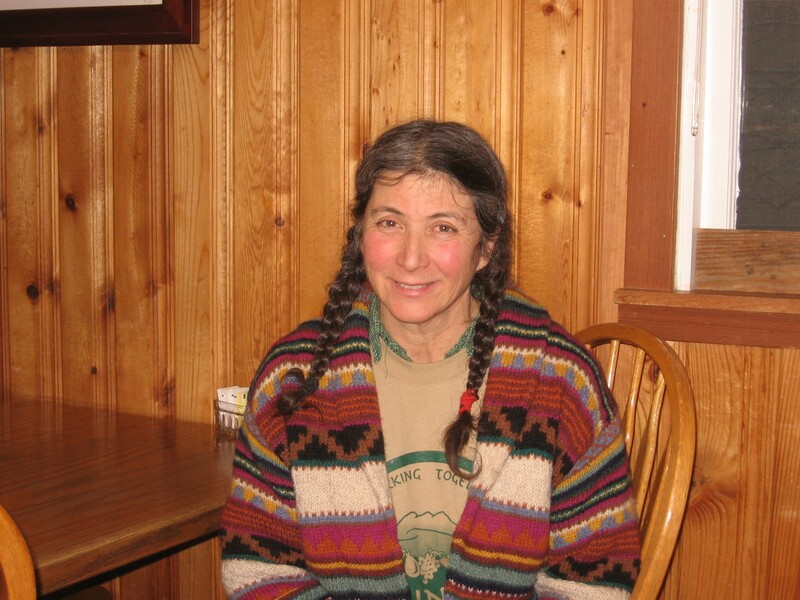 As for those wishing to join the Mountain Community Co-op, Margaret extends an invitation to everyone. Membership requires a one-time $100 payment and a modest number of hours of volunteer labor, some of which can take place at home, such as accounting and correspondence work. 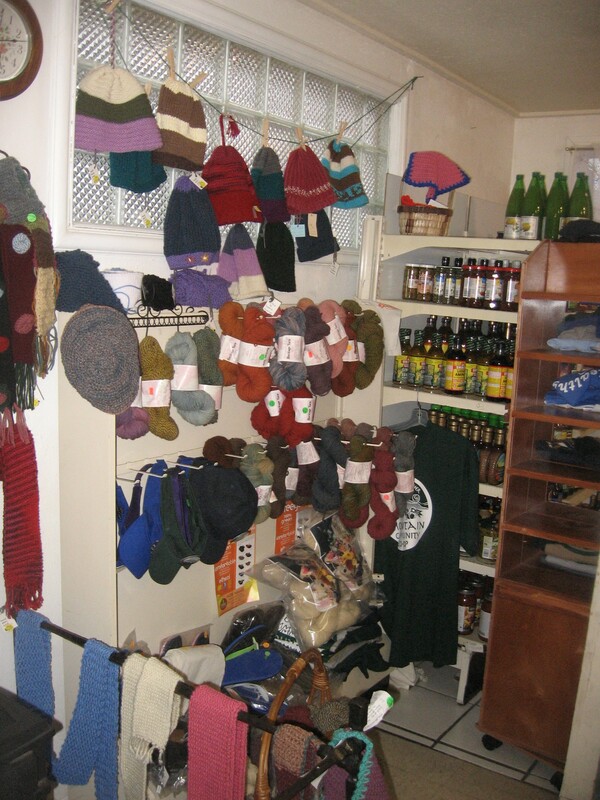 As an added incentive, volunteers receive discounts on goods purchased at the co-op. For more information, contact the co-op at eatonvillecoop@yahoo.com or call: (360) 832-2667. This entry was posted in Culture, Eatonville News, Environment, Graham News, Nature, Remarkable men and women, Self Reliance and tagged Local economies. Bookmark the permalink.